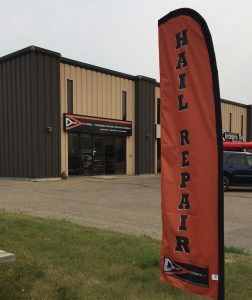 Our Red Deer location which services Red Deer and surrounding areas has been in operation since 2013. Offering industry leading paintless Dent Repair, a strong commitment to customer service, and a quality control process which is second to none, we have managed continued growth which has brought us to our third location. Located at #1, 7450 – 49 Avenue Crescent. We typically have 3 full time employees and any number highly skilled technicians available at any given time. If you are unfamiliar with the process of paintless Dent repair I can tell you it is one of the most environmentally friendly ways to repair the exterior panels of a vehicle. The process involves specialized lighting, a variety of hand crafted tool and keen hand/eye coordination. The dents are removed by making calculated pushed to the back side of the metal, slowly messaging that metal back into place. This process does not affect your factory paint nor does it require replacing factory OEM panels. Our methods are significantly faster than conventional repairs and a lot less intrusive. At Dent Force, our commitment to our clients is built on the same foundation as our company – a foundation of quality workmanship and exceptional service. Dent Force is proud to be a 100% Canadian company. The technicians we use are Vale certified, and they are trained to excel in all aspects of service. We consistently meet or exceed the expectations of our clients with the quality and timeliness of our repairs. Dent Force is proud to be a repair partner for The Co-operators and Wawanesa Insurance and work with all other insurance companies offering our positive team attitude, industry leading skills, and fair approach to delivering the quality repair you deserve. Don’t just take our word for it! Check out our awesome Red Deer dent repair reviews. I am a red seal autobody technician, so when it comes to having my vehicle worked on i am extremely particular about how it is done. I am blown away by the professionalism and knowledge Mike has acquired and the effort he puts forth is unmatched by anyone in Red Deer hands down. You WILL NOT find someone who knows more about cars/trucks/bikes (both classic and modern) than this guy. A++ anything with wheels on it, any questions you may have, this is your guy!! Sherri at the front desk is very welcoming and polite great costumer service. very efficient place and great staff. The gentleman who looked at the dents on my car his name has slipped me but very professional and wonderful to deal with! I checked out all the dent repair shops in Red Deer before taking my low mileage, original paint, collector car to them. They did an awesome job for a reasonable price. Fast and courteous too. Highly recommend these guys. Went here for an insurance claim on hail damage. They did a great job. Staff are extremely accommodating. When I went to pickup my vehicle it was quite dirty on the inside and I wasn't impressed. Went back in and with an apology and a smile he ripped the car around back and cleaned it up. Staff definitely care about the customer.